Well if my WordPress stats are any indication, an awful lot of people are looking for recipes for full sour and half sour pickles. I am very happy to oblige. Last week I checked on my full sours daily, and once they started to take on that pickley olive green color, I started slicing off a little slivers from the end of one of the cucumbers to sample a taste. By Sunday they tasted just about right to me, so I decided it was time to transfer them to jars. They could have fermented for a few more days if I wanted them to be a little more sour, but I thought they tasted pretty good at this point. A little salty, a little sour, and a little spicy. I sliced each cucumber vertically into four spears, and sliced up the garlic too. I then packed them into clean jars and poured the brine over them. They will keep for months in the fridge. With my pickle crock now empty, I decided it was time to start another batch. “Half sour” pickles are a staples of diners and delis in New York, but I don’t think they are well know elsewhere. The key difference between half sours and full sours is the strength of the brine. According to Linda Zeidrich, a less salty brine will cause your cucumbers to ferment more quickly, resulting in less sour pickles. This seems counterintuitive to me, but Linda Zeidrich knows her pickles. These pickles are salty and just a little tart, and they keep a little more of their bright green color and crunchiness. It’s best to make them in small batches because you’ll want to eat them within a few weeks. I also prefer to make them with small cucumbers, but since my cucumbers were a complete failure in the garden this year, I’m stuck with what I can get from the farmer’s market, which are usually full size pickling cucumbers. Trim the blossom end from your cucumbers and layer them in a large jar or crock with a few black peppercorns, some coriander seed, a bay leaf, some dill, and a small hot pepper, slit lengthwise. Make a brine of 2 tablespoons fine grain salt per quart of water and pour it over the cucumbers. Weigh the cucumbers down with a brine bag or a plate so that they stay submerged. 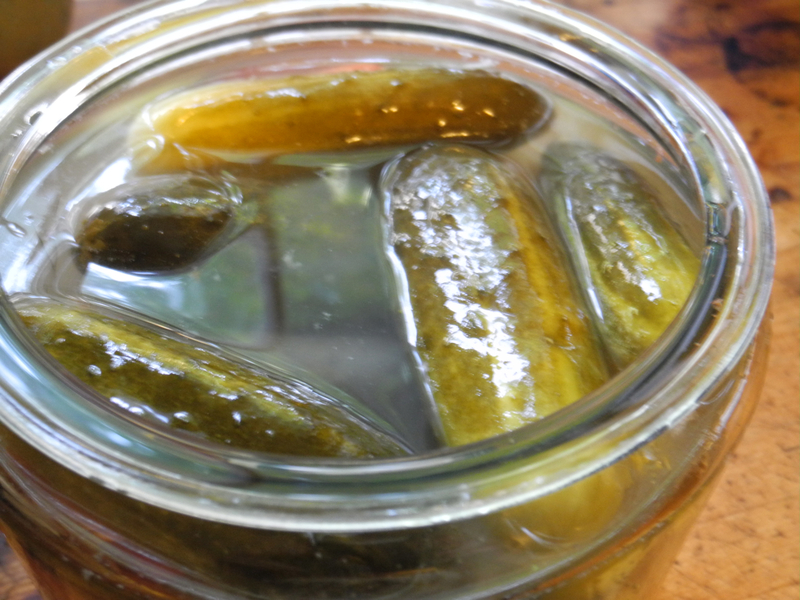 Keep the pickles at room temperature while they ferment. If scum forms on top of the brine, skim it off daily. Within three days you should start to see bubbles rising to the surface, which means they have begun to ferment. The pickles should be finished fermenting within a week, but you can begin tasting them after three or four days. Transfer them to the fridge when the flavor is to your liking. Posted on August 28, 2012 by kate. 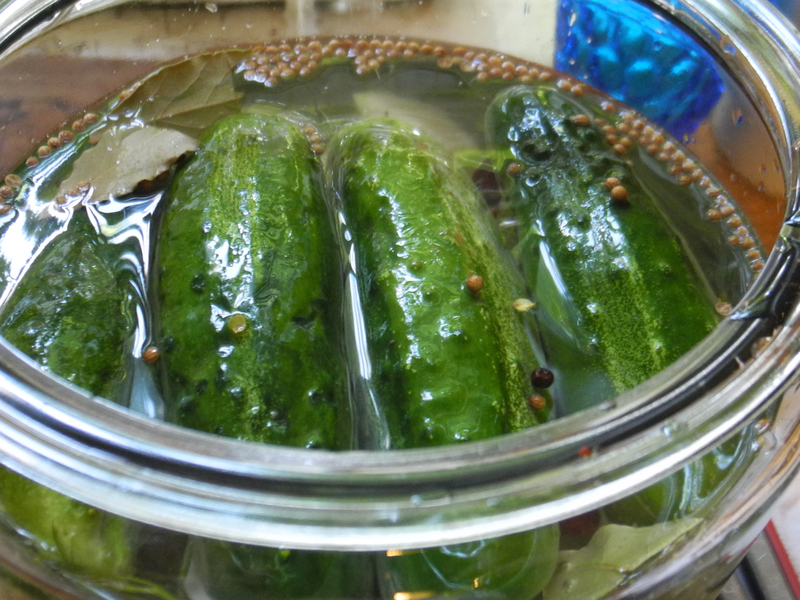 This entry was posted in Preserving and tagged cucumbers, fermentation, full sours, half sours, kosher dill, lacto-fermentation, pickles, Preserving. Bookmark the permalink. They sound wonderful! Don’t feel too bad about your non-cucumber year…you know that bumper-crop of mine? They made awful pickles. Either the seeds were mislabeled, or our growing conditions were just wrong…. Oh, well. There’s next year! Sorry to hear about your cukes. How disappointing! Yes, I’m sure next year we’ll figure out how to grow decent cucumbers! Glad to see that you’re going to keep up the focus on pickles right now; super! Yum – pics are wonderful. I’m afraid our cukes are done for the season. Your pickles look great. Good post. 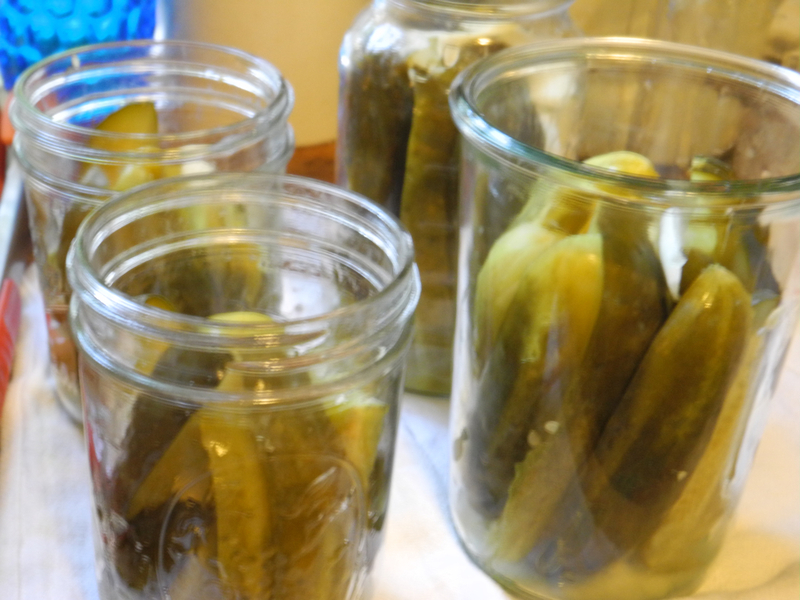 So psyched to learn about making pickles – it’s one project I hope to try next year – thanks!